Yesterday Microsoft launched its holiday-named “Don’t get Scroogled” campaign. The campaign is smear attack promoting Microsoft’s Bing search engine over Google’s own. Microsoft wants everyone to know that Google Shopper, it’s product search engine, only displays search results from products and merchants that pay a fee. 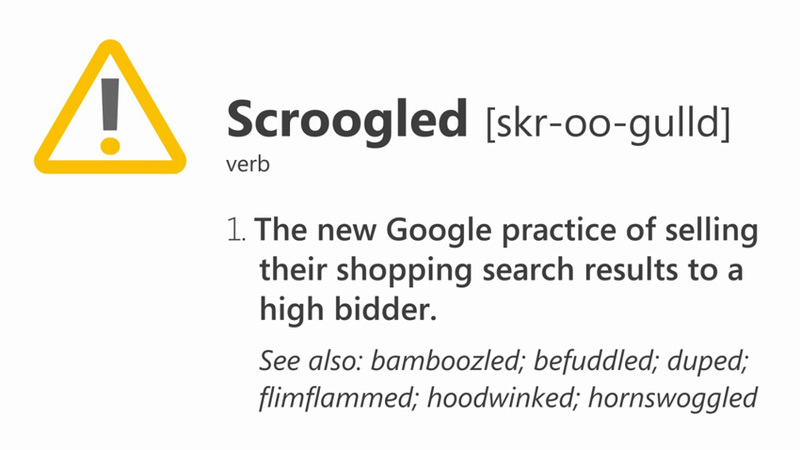 Phrases like “From Google to Scroogle,” and “Don’t get Scroogled this holiday season” pepper the splash page, as do prompts sending you to Bing or allowing you to make Bing your homepage. The statement above is a direct attack on Google, and hints at the “Scroogled” campaign to come. Google announced that its Google Shopper search engine and Android app would begin utilizing only paid results some time ago, but the average consumer probably doesn’t check the Google blog on a daily or weekly basis. And most people probably don’t know how Google Search and Google Shopping respectively function, even with the pop up disclaimer Google has been displaying on its shopping page. Google’s pay-to-play scheme for Shopping took effect this fall. “Google began the transition in May but made the switch in its entirety on October 17, 2012,” Weitz tells me. That means this is, in fact, the first holiday shopping season that Google has based its shopping results solely on monetary partnerships and not the relevance of a product. At the time, Bing was still running its merchant center, where other shopping platforms could sign up for this same kind of special treatment. Now, Bing is directing merchants to go through Shopping.com instead of its own client, and says it will highlight the paid-for results. Bing representatives say it is doing this to keep quality high during the busy shopping season, when spammers can hit hard. “After the holidays, we will again reopen our program to accept free feeds from new merchants,” Weitz says. But how does Bing Shopping’s algorithm surface results, then, exactly? We asked Microsoft, but got nothing but PR spin. Weitz told us that “Bing includes millions of free listings from merchants and rankings are determined by which products are most relevant to your query. While merchants can pay fees for inclusion in our third party shopping sites and subsequently may appear in Bing Shopping through partnerships we have, we do not rank merchants higher based on who pays us, nor do we let merchants pay to have their product offers placed high in Bing Shopping’s search results.” Bing, like any other search product, won’t discuss its algorithm in any more detail than explaining that its system crawls the Web and data from its feeds to surface the shopping results. Okay, so what does this all mean for you, the consumer desperate to get your holiday shopping on? Basically, you must choose between two evils: Both Google and Bing Shopping partner with merchants or merchant outlets and promote sponsored products. Neither search engine will get very specific, although Google’s phrasing that it’s “compensated by these merchants [and] payment is one of several factors used to rank these results” seems to suggest a high number, or all, of its top results are essentially ads, while Bing specifically says it doesn’t factor in who pays what for its results. And you can see that when you just use each platform’s search engine for products, Google includes a “Sponsored” label, whereas Bing doesn’t. With Google, you know things are paid to be there, and with Bing, the distinction isn’t as clear – although it says this isn’t part of how it surfaces results anyway. We’re splitting hairs, really. Bing uses a pay-to-be-listed model, and Google uses pay-for-positioning – both methods are shady, and shows that online shopping is anything but a fair fight. When Bing says payment isn’t a factor, that isn’t quite true: You can pay Shopping.com to be listed on Bing Shopping. You can’t, however, pay to show up on page one, according to Bing. Over at Google, how much you pay will be considered (among many other signals that we aren’t privy to). Google has gone whole hog on pay-to-play with its Shopping product, which is a risky decision for a search engine that once prided itself on its fairness. Sure, it’s being transparent (although plenty of users will never hit that “Why these products?” icon), but Google is only as good as its reputation. Whether I’m looking for a news story or an answer to a question or where to buy a Boba Fett bathrobe (it exists and it is magnificent), I want unbiased results, regardless of what Google banner tab I’ve clicked. Plenty of users think they are getting the same experience, but there are different rules and regulations and ranking systems depending on whether you hit “News,” “Shopping,” “Search,” and so on. Bing isn’t above all of this, but the point of the Scroogle campaign (in addition to blasting a main competitor and getting some eyeballs on Bing Shopping) is to highlight something that the biggest search engine in the world changed back in the summer and only recently implemented. Maybe it changes how you search for products online, and maybe it doesn’t – either way, Google needs to be more clear about its methods, and so does Bing.